our open house last month was such a success, weâ€™re having another one! IF you missed the last one, join us for our season-opening festivities coming up MAY 9th 11-5 PM at cooper boating, granville island (1832 mast tower rd, vancouver)! boats will be open for viewing including ALEGRIA ~pictured below~ *PLUS* free boat rides and informative clinics will be offered throughout the day! Â *AND* last but not least... the BARBECUEÂ will be up and running! We can't think of a better way to celebrate the season! John started sailing when he was 10 years old in El Toros on Henderson Lake in Lethbridge, Alberta.Â The family joined the St. Maryâ€™s Sailing Club a few years later where John sailed and raced Enterprises and Lasers. Â He got lucky and won a race in 1967, and was sent to Ottawa to represent Alberta at the Centennial Regatta. Â His crew was the youngest crew there, and he was the youngest sailor in the entire Regatta. 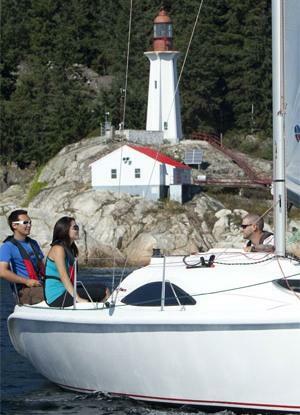 Â Â He continued sailing and racing during his working career in Ottawa, even gaining the title of a director of the New Edinburgh Yacht Club for a term.Â When his career brought him to the West Coast, he upgraded his knowledge of boats and diesel engines by Â taking a number of courses with Cooper Boating. Â John has been a long time member of Cooper Boating's Cruising Club, which he joined in 2002, and became even more involved with Cooper after his retirement, when he took his Basic Cruising Instructors Certification in 2010.Â He has also taken his Intermediate, Advanced, and Off-Shore courses through Coopers.Â He is currently working on completing his Intermediate Cruising Instructor and Basic Instructor/Examiner certifications.